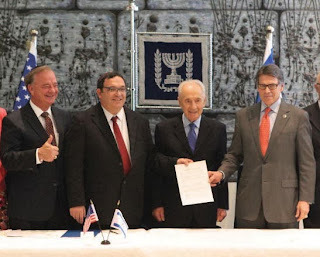 John Sharp gives thumbs up as Shai Piron and Texas Governor Rick Perry hold the signed agreement in front of Israeli President Shimon Peres. On Oct. 23, Texas A&M announced plans to build a campus in Nazareth, the first United States university to open a branch campus in Israel. The Texas A&M Peace University would offer advanced degrees and emphasize attracting Jewish, Muslim and Christian students and faculty in what is Israel’s largest Arab city. 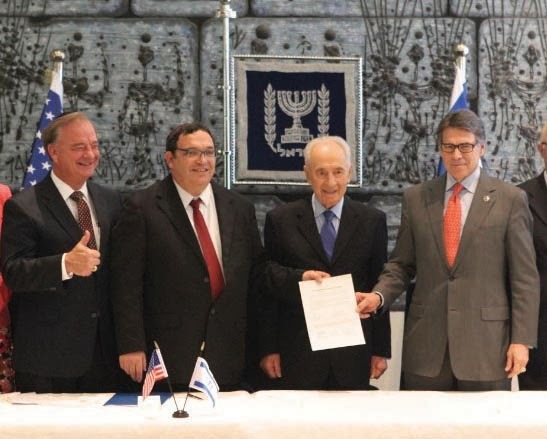 The announcement was made during a ceremony between Texas Governor Rick Perry and Israeli President Shimon Peres at Peres’ home. Peres hopes the campus will promote higher education and peace, and help narrow the gaps in higher education between Israeli Arabs and Jews. The university will raise about $70 million from private donors to build the campus, and the opening is anticipated in fall 2015. The fundraising has to be completed before construction begins; last year the Texas A&M system raised $760 million overall. The Knesset will also have to approve the arrangement, as branch campuses of foreign institutions have previously not been permitted in Israel. This is the second Middle East campus for Texas A&M. An engineering school in Doha, Qatar, has 550 students from 30 countries. The Nazareth campus will include the takeover of the financially-troubled Nazareth Academic Institute, which was formed three years ago. Pastor John Hagee, founder of the million-member Christians United for Israel, made the connection between the university and Israeli officials at Sharp’s request. Hagee has a church in San Antonio.